Don't get me wrong -- I love these dog days of summer when every weekend is planned out for camping, visiting friends or road trips out to ranch weddings and the day itself just seems to drag well on into the evening, perfect for a late dinner and drink rendezvous. But I still get giddy for the coming of fall. Crisp air. Shorter days. The promise of holidays right around the corner. And fall wardrobe shopping. Of course, when Club Monaco tapped me to pick out a few fall favorites from their August collection, which you can see here, I was beyond happy to do so. Their relaxed yet sophisticated city vibe has always resonated well with my style and this fall collection in particular makes for the perfect foundation for fall dressing. Think trench coats with leather touches. Full skirted shirt dresses. And lots of patterned separates that are begging to be mixed, matched or worn together for a little extra oomph. Check out the rest of my outfits and my other fellow style muses on Club Monaco here -- and would love to know, what would you pick from the August collection? Let me know in the comments below! Love these 2 looks! I especially like the dress! LOVE BOTH PRINTS ESPECIALLY THE SHIRT..GREAT PICS KRYSTAL! Beautiful looks, love these soft prints! Your dress and top are gorgeous!! 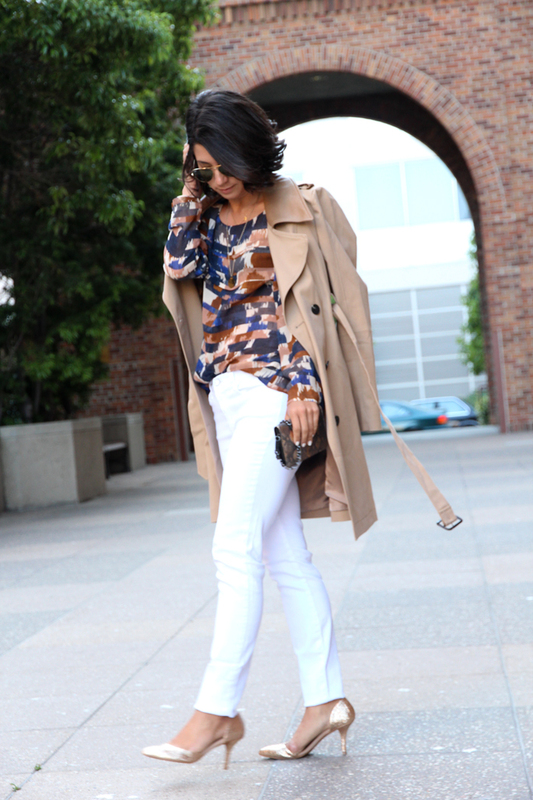 I love the printed top with the white jeans and trench! I love the dress and the top and the trench...and well really everything in both looks! Great styling! Gorgeous dress!! I love both outfits. Fabulous! You look so stunning and glamorous! I love a classic shirt dress! The print is gorgeous too. Great picks Krystal. You look gorgeous in the dress! slightly obsessed with that silk blouse! LOVE the print!! I really like how the patterns say fall but the shapes are more versatile! woah that red dress is gorgeous! Oh I absolutely LOVE both looks! That dress is fabulous! I currently don't own any Club Monaco pieces, however I'm in awe of their preppy meets chic style. My picks for their new season are the quilted trench and blair dress. Also love the jarel jacket that's now on sale. I'm loving the navy and burgundy colors together for fall. You look amazing in both the looks and those glitter shoes are AMAZING!! Love the dress, the shape is effortlessly classic. ooooo that trench is to die for! If only Club Monaco was more in my price range because your dress is beyond lovely. That dress is so pretty and those white pants are classics. Adore your styling here. This shirt dress is perfect on you! So gorgeous, lady! I ADORE both, but especially loving the trench outfit. PS: Can you believe NYFW is so close.. Lets make dinner plans soon! I just saw their new displays in the windows, but these looks are even better on you! Love those Miu Miu shoes, can't take my eyes off them. Love your gold shoes, so cute! love both outfits...the shirt is amazing! 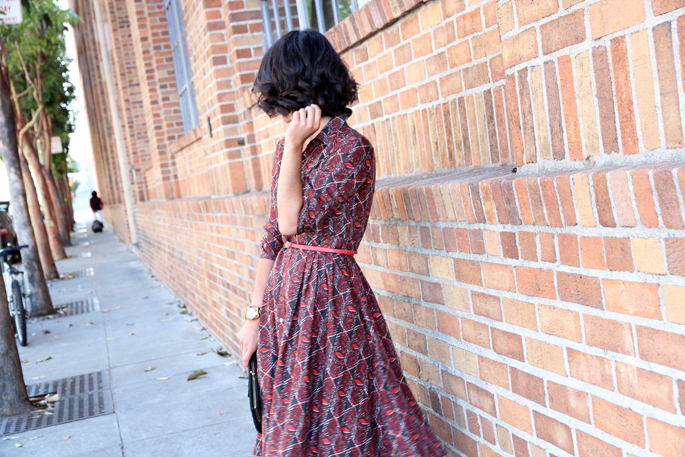 Great dress really great separates from Club Monaco. They always have great items! I'll be sure to check out the others too! Love both pairs of gold shoes!